In the summer of 1947 rock ‘n’ roll was being born in the steamy environs of New Orleans. But of course if you’ve been with us from the start here on Spontaneous Lunacy you knew that already. What you might not have known was that immediately after the birth there was a convoluted series of wild events that took place surrounding the screaming infant in which most of the Ten Commandments were broken, among them lying, cheating, bribery, adultery, a natural disaster, theft and a near murder… and that’s just for starters. Though it goes without saying that rock ‘n’ roll was never going to exactly play by the rules and behave itself, the lurid story behind it how it all began was something even rock would have trouble living up to in the years to come. We’ve already met Roy Brown whose Good Rocking Tonight started all this furor. What we left out of that telling though was that he only went to New Orleans in the first place because he had to flee Galveston after he’d had an affair with the girlfriend of the owner of The Granada Club where he’d been successfully headlining for months which is how all of this got set into motion. It was only then, after he landed in the Crescent City, that he wound up signing with DeLuxe Records early that summer after label head Jules Braun listened to him sing over the phone at 3AM long distance to New Jersey. In the intervening time between recording the fateful song in July and its release in September Brown took up residence at the Down Beat Club in New Orleans where he was paired with fellow singer Clarence Samuels, each earning a paltry $4 a night. Of course at this point nobody, least of all Brown himself, had any idea everyone’s life was about to be turned upside down. Then Good Rocking Tonight was released and all hell broke loose…. literally in fact, as a hurricane tore through the city, the water breaching the levees, killing 31 people and causing over a hundred million dollars in damage as part of the city sat for weeks under six feet of water! But that was nothing compared to what was happening to Roy Brown. The furor caused by his record meant The Down Beat Club was now packed to the gills each night, turning people away at the door and the admission to the place suddenly went from 75 cents to two bucks. The club’s owner, Freeman Harris, desperate not to lose his now star-attraction, generously offered Brown a raise to $8 a night (Samuels was told to be happy with the four dollars he was getting or he could take a hike… Samuels was no dummy, he stayed put). But Harris then overplayed his hand by uncharacteristically giving Brown a two dollar bonus after Friday’s show, telling him he should move out of the cramped quarters he was sharing with Samuels and offering him a room above the club – for FREE! – and Brown began to sense something was up. Of course all of this was so Harris could keep Brown closely guarded and not let him slip – or be stolen – away. But Freeman Harris apparently forgot to put locks on the door because the next thing you knew the owner of The Starlight Club, a much classier place uptown, tracked Roy down and offered him $50 a night, along with free room & board, all his meals paid for and a wardrobe of flashy new clothes. Roy thought it was all just a joke until he saw the cash and the contract and realized what it all meant. Surrounded by double dealings galore, lies, bribes, and shameless displays of naked greed and avarice over the freshly minted budding star, Brown caught on quick to the wicked ways of showbiz and promptly cashed in and took the better gig. Enter Sammy Goldberg, who despite his Jewish name was an African-American working as a talent scout for Aristocrat Records from Chicago. He’d come down to New Orleans, likely the result of Annie Laurie’s recent success with Since I Fell For You as much as Brown’s record, and was looking to sign somebody from what was fast becoming the ground zero spot for a musical revolution. Keep that last point in mind. Yeah, I think you can see where this is headed. Clarence Samuels promptly signed with Aristocrat, was hastily taken to Chicago where he cut four songs, three of which were Roy Brown’s. The only one he did NOT cover was ironically Good Rocking Tonight, the one causing all the commotion! Remember the point about “all the girls he could screw” when Brown was acting the big shot as the toast of the Crescent City? Well it seems one of the ladies whose ink well he dipped his pen into was the wife of a California tough guy and along the way the tough guy found out his little woman was sleeping with a singer named Roy Brown when she was galvanting around New Orleans. Needless to say he wasn’t too pleased with this news but New Orleans is quite a distance from Oakland, California and so Roy seemed to be safe from retribution. Needless to say they skipped desert that night. Instead he grabbed her, grabbed his gun and raced to the station where they met Samuels coming down the stairs. Upon being asked if he was Roy Brown, the unsuspecting Samuels who was happily playing up his newfound “stardom” and thinking this merely an overzealous fan, replied proudly that he was and even asked them if they’d heard his new record! When the gun came out Clarence Samuels wished he was back in New Orleans making four dollars a night at The Down Beat Club. His life was spared only when the wife insisted it WASN’T Roy Brown and Samuels then proved he wasn’t by taking out his driver’s license, presumably right before he passed out. How convincing WAS Clarence Samuels in his role of Roy Brown prior to his near death experience? Well, although all of the participants in the matter, including I’m assuming the girl who probably would know best, are long since departed we have some very pertinent evidence to be able to answer that question in the form of the Roy Brown songs that Clarence Samuels covered, most notably Lollypop Mama. You’ll recall the fact that DeLuxe Records were so focused on getting Brown’s surefire hit on record that they paid only cursory attention to its flip side, the original version of Lollypop Mama and making matters worse was the fact the band Brown was assigned for the recording session proved to be totally incompatible with the material, thereby depriving him of suitable support for what otherwise had the makings of a very good song. Samuels, in perhaps the ONLY break he wound up getting in all this, had a far more competent crew backing him in Chicago led by Dave Young which goes a long way to improving on the weaknesses inherent in Brown’s original take. Here the horns play a simple unobtrusive riff behind Samuels during the meat of the song, churning out the rhythm with modest efficiency and keeping it thankfully rooted in the present. It’s nothing special by any means but far more suitable for conveying the right mood, or at least not getting totally in the way as Bob Ogden’s group did on Brown’s record. 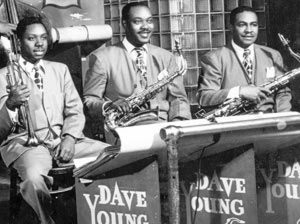 Where Young’s band really shines in comparison is in the instrumental break as the sax lets loose while Samuels shouts his encouragement from the sidelines, the energy level rising noticeably as they all seem to be having legitimate fun. It’s certainly not a classic solo, even at this early stage in rock’s life it’s already been surpassed by others, but the difference in attitude between it and the trumpet-led monstrosity that marred Brown’s efforts is considerable and the record rides that enthusiasm for all its worth. Which brings us back to Clarence Samuels, the would-be Roy Brown (not to mention very nearly the LATE Roy Brown!). Though Samuels will actually go on to have quite a long career as a recording artist, someone we’ll meet up with occasionally for years to come, he was rather limited in his skills. Brown himself, while admitting that Samuels was talented also said Clarence’s gruff voice wasn’t very pleasing, and unlike Roy’s flexible tenor Samuels had a very strident baritone and so despite his best efforts here to mimic Brown’s declaratory style they simply SOUND different and no amount of subterfuge can mask that. His chesty voice rumbles and echoes as if enthusiasm alone will compensate for what he lacks otherwise. He tries his best but you have to feel almost sorry for Samuels as you can see him desperately trying to remember exactly how Roy phrased each line so he can imitate it to the letter. But since he clearly has no idea of Brown’s underlying motivation regarding the lyrics his inflections are stiff and he subsequently falls short in imparting it with much authenticity. Some lines need more emphasis, others less, but you get the idea he wouldn’t be aware of how to improve it were he given another shot at it. He does get more into it as the song goes along though, loosening up some and actually besting Roy on the semi-spoken interlude – “Ooh Ouch! Stop!” – acting that part out with believability (maybe by envisioning the beat down he was sure to receive should he run into Roy on the road after all this). Perhaps his confidence being bolstered by hitting that passage just right he finishes on a high note as he starts to wail with abandon in the fade. Crude for sure, but reasonably effective and most importantly more up to date stylistically than the original. If you could somehow graft Brown’s vocals with this backing track you’d have a much better record than either of them came up with on their own. While it’s usually the vocalist who makes the biggest difference in the success or failure of a song aesthetically that’s not quite the case with Lollypop Mama. Brown had been forced by his backing musicians to rush through his take, robbing it of its potency and creating too big of a hole for him to climb out of to salvage it. Samuels, while clearly having no chance to beat Brown on a level playing field, takes that one decided advantage and runs with it, and helped by his musicians rather than hurt by them as Brown had been Clarence manages to eke out a small victory in the end. I suppose you could say that with everything he went through in this ordeal he was entitled to that much if nothing else. 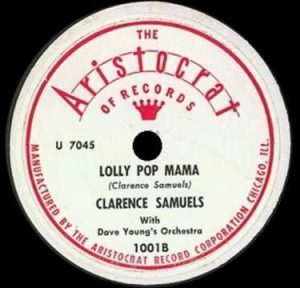 Leave a reply on "Clarence Samuels: “Lollypop Mama”"